For fans of the finesse, lively lines and elegant landscapes of Japanese printmaking, any opportunity to view the works of Karsushika Hokusai (1760-1849) is a pleasure. So despite its slightly haphazard layout, lack of explanatory texts and very dim lighting (partly to protect the works), this exhibition of 40 or so prints from the various Japanese collections of the Musée Guimet is sure to be a popular one. 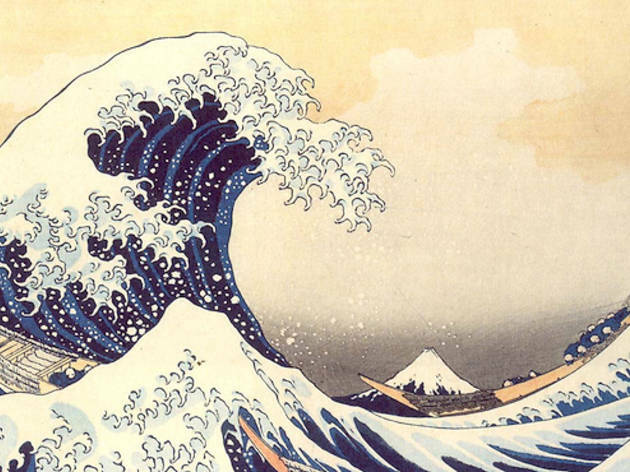 The master of ukiyo-e, pictures of the floating world, Hokusai’s modernity fascinated the impressionists, and his extraordinarily expressive style also prefigures the work of manga graphic artists. 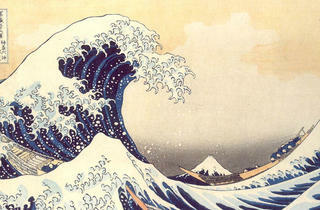 His famous ‘Great Wave off Kanagawa’ is the iconic work of Japanese printmaking (and theme for many a screensaver). But the ‘Gakyō Rōjin Manji’ (The Old Man Mad About Art) also had interest beyond landscapes and waves, as can be seen in three small portraits of a monster, a demon and a phantom (extracted from his ‘100 Fairytales’).